As a teen, Hesham Shehab took his gun and prowled the streets of Lebanon by night, stalking his Christian enemies. 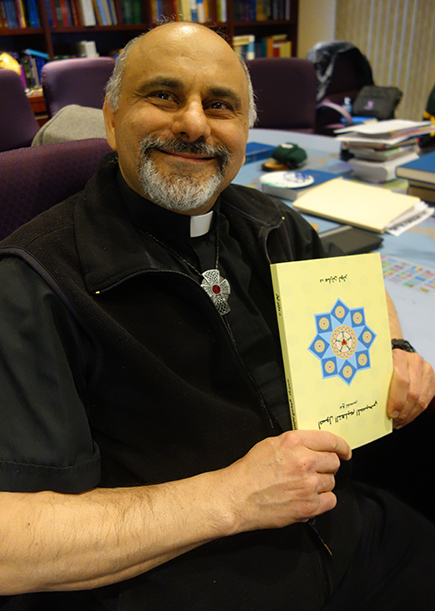 Today, he is a Lutheran pastor and translator/editor for LHF’s Arabic materials. It’s an amazing story of God’s ability to transform a dark soul. In 1960, Rev. Shehab was born to a Lebanese Muslim family that traced their family heritage to the tribe of Muhammad, the founder of Islam. At the time, Lebanon’s population was about half Muslim and half Christian, and tension was high as the two groups’ militias constantly attacked one another. Anger and desire for revenge burned within young Hesham. Recognizing his passion for Islam, intelligence and leadership capabilities, the local mosque recruited him for jihad and to preach. But on the very day that Hesham was to preach his first message, God intervened. On the way to the mosque, his car was hit head-on, and Hesham spent the next several weeks in the hospital. Not long afterward, another tragedy befell the Shehab family: Hesham’s brother was killed by the Christian militia. “I started searching out the Christian militia to get revenge; I got a silencer and gun for my evil plan,” Rev. Shehab recalled. “Then, I signed up for a cultural studies course at the university that included selections from the Old and New Testaments. “I was a devout Muslim who prayed 5 times a day,” Rev. Shehab continued. “I had memorized half the Quran by heart, but I had never heard anything as powerful and genuine as that.” It was the beginning of a journey to find the Truth. His search led him deeper into Scripture and eventually, God made his path to cross with a missionary from Lutheran Hour Ministries who shared with him Luther’s Small Catechism. As the years passed, Rev. Shehab began using the book frequently to explain the Christian faith to Muslim friends. Now, Rev. Shehab is helping to improve the Arabic catechism translation (originally translated by Lutheran Hour Ministries) by updating the language to reflect the way modern Arabs write and speak – a Godly task 16-year-old Hesham could never have imagined back in the 1970s. Click here to read the story of how the Holy Spirit brought Rev. Shehab to faith.